Cross training is commonly known as a kind of exercise that uses various types of training to build specific parts of fitness. One of the most vital pieces of equipment that allows you to successfully cross train is your shoes, and with New Balance Men’s MX623v3 Cross-Training shoes you will receive the comfort and durability needed in achieving the best exercise workout. Rather than buying a cheap pair of sneakers from some downtown place, it’s time that you look at this most efficient cross training shoe that’s available for you made by New Balance. The New Balance 623 has been designed for the athlete to provide them with cushioning and comfort while doing strenuous workouts and still be fashionable in the process, making a great statement at the gym. These cross-training shoes are available in 7 different diverse colors to choose from. The shoe with its modern design provides you with a fashionable look inside and out. New Balance has been providing durable shoes for years now and one of the top brands on the market these days. 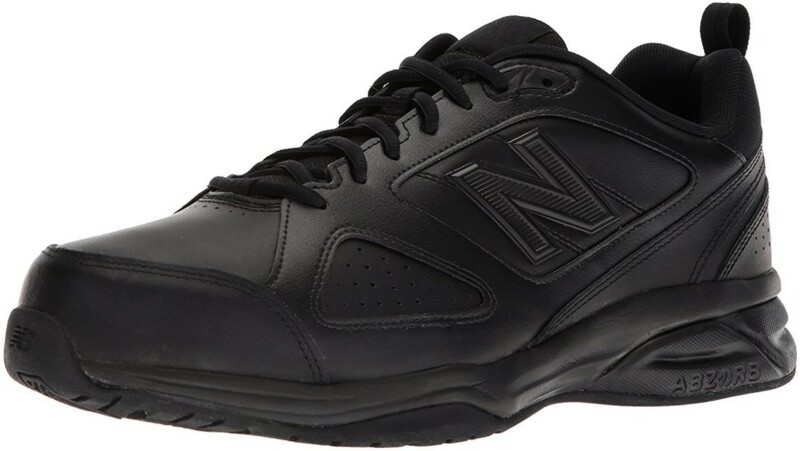 The New Balance 623 is made out of premium leather uppers that provide you with flexibility and durability while still feeling comfortable on your feet. The non-marking rubber outsole provides you with the grip needed while walking, jogging, basketball and even football whatever you do these shoes will assist. The shoe has Injection-molded EVA midsoles with ABZORB in the heel and forefoot cushions to provide impact when doing squats or weight lifting. The removable padded insole adds for even more cushioning and support; Moisture-wicking lining helps to keep your feet cool and dry. And the Phantom liner provides you with lightweight comfort while providing phenomenal fit. In total the shoe weighs 12.6 Oz (356g) in total making this shoe very light on the feet, providing you with the most natural feel of walking barefoot. The biggest problem there seems to be at the moment with the New Balance 623 is that there have been many problems regarding the new sizes that are being made as the older sizes use to be a perfect fit when purchasing. This could be, because many of the shoes that are now purchased online have not been made in the USA and suggestions made by consumers advised that you should buy a size bigger. I would suggest taking note if the shoe has been imported as they do mention it when purchasing online. What do the customers feel about this cross-training shoe? The customers who have purchased these training shoes in general are very happy with how fashionable, comfortable and flexible they are. There have been quite a few remarks regarding the size of the shoes, advising that many have been using New Balance shoes in previous years and the size has seemed to change. Most customers are very pleased with the cross-training shoe and find them comfortable to use as they provide you with a fit for even broad feet and there are many sizes to choose from. Some consumers advised that they even wear these sneakers as business-casual work shoes. The New Balance MX623v3 Cross-Training shoe provides men with the comfort needed while participating in all types of sport making this shoe very versatile. Many consumers are happy with the shoe, as it provides them with an excellent shoe to wear all day round and has been highly recommended to all even for those who have foot and lower back problems. They are a great investment and even affordable on the budget.